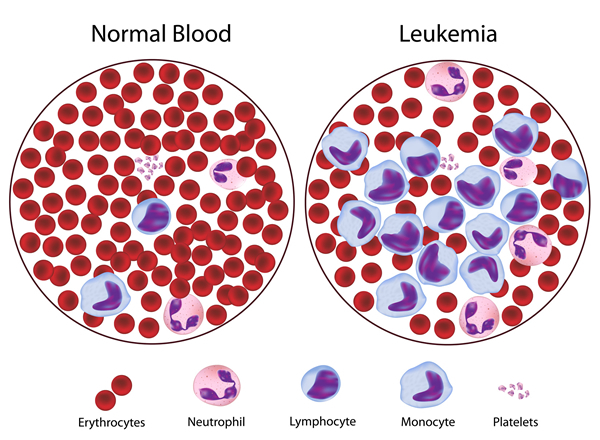 Causes of Leukemia: What Causes Leukemia? Understanding the causes of disease is essential to create effective prevention campaigns and to cure patients. This can easily be observed in the clinical management of cancer. Cancer has one of the highest mortality rates, in some cases due to a late diagnosis, while in others, no treatment options are available to the specific type of cancer. Even though cancer has a high mortality rate, in the past decades prognosis has improved due to improved quality management of the disease based on recent scientific discoveries. Nevertheless, lots research is still needed to fill in the gaps in our current knowledge. One of the best-understoodtypes of cancer are leukemias. Leukemias are a special type of hematologic cancers which derive from the myeloid hematopoietic system. Like many cancers, many different causes have been proposed but the exact causes of leukemia are still unknown. To comprehend current hypothesis and models of leukemic development, it is essential to understand the histological tissue from which these cancers developed, in this case the hematopoietic system. Additionally, the general mechanism of cancer development needs to be integrated to the malignant development in this tissue. This will provide the general framework by which the causes of leukemia affect each individual subtype. Leukemias originates from the hematopoietic system, a structure responsible for the generation of all hematologic cells. The most important cells are the stem cells from which diverse cells can generate. But, it is important to recall that the hematopoietic system is composed of other cells and structures that provide a controlled environment. Together, the stem cells and its controlled environment, are described as the stem cell niche. The stem cell niche proves essential to control the proliferation and differentiation of stem cells to match the physiological requirements. Another layer of control, exogenous to the niche, are the numerous growth factors, which promote proliferation, differentiation, and inhibit apoptotic mechanism. The function of hematopoietic stem cells makes them particularly susceptible to become malignant. This group of cells needs to be in constant division and their regulatory systems are relatively fragile towards deregulatory mechanisms. All, of these mechanisms will lead to the creation of cells with the characteristics described as the hallmarks of cancer. The hallmarks, first defined by Hanahan and Weinberg in the year 2000, include sustaining proliferative signaling, evading growth suppressors, resisting cell death, enabling replicative immortality, inducing angiogenesis, and activating invasion and metastasis. Additional to this, in 2011, two additional hallmarks (dysregulation of cellular energetics and evasion of the immune system) and two enabling characteristics (genomic instability and tumor-generating inflammation) were added. The importance of the hallmarks of cancer when studying the causes of leukemia, is that these characteristic summarizes what alterations can result in malignant cells. Either, through genetic or environmental factors, the regular cellular function is affected. It is important to make the distinction betweengenetically inherited factors and genetic alterations in specific cells. The first are alterations in which regular genes are dysfunctional and the person inherits these alterations. Therefore, all cells will have the alteration. In contrast, the alterations in specific cells are the result of lesions particular cells in the body and only these cells will have the genetic alteration. Almost all cancer cells have somatic mutations but not all cancer cells have inherited genetic alterations. Regardless of this, both inherited genetic and environmental causes of leukemia need to be considered. In order to understand the possible mechanisms by which inherited and environmental factors function as causes of leukemia it essential to organize the development of cancer in an organized manner. Cancer cells, are the result of the accumulation of genetic mutations but in many cases an initial alteration can be identified. For example, in leukemia the most common initial alterations are diverse chromosomal translocations. These alterations can be described as the mechanistic causes of leukemia, because they initiate the process by which cancer cells are developed. But mechanistic causes derive from other factors. These factors can be identified as the underlying causes of leukemia, as they are the definite causes of the mechanisms which produce leukemic cancer cells. In other words, the causes of leukemia can be identified as either as the underlying causes or mechanistic causes. These are distinguished by its causality; the underlying causes produce the mechanistic causes. The underlying causes were previously identified, the environmental and inherited factors that produce genetic mutations in cells. Most of the genetic mutation identified in leukemias are chromosomal translocations. Chromosomal translocations are the alterations of chromosomes in which separate chromosomes are joined in an abnormal manner. This results in the alteration of the expression of essential gene expression which can cause the initial steps. Because of this, chromosomal translocations can be described as the mechanistic causes of leukemia. Translocation can cause genetic alteration which leads to leukemia by two mechanisms. One mechanism is by altering the regulatory regions of certain genes. Regulatory regions allow cells to control gene expression but as the result of translocations, the physiologic regulatory mechanisms are lost. This will result in either an increase in the expression of oncogenes (genes which can induce malignant behavior) or a decrease in the expression of tumor suppressor genes (genes which inhibit malignant behavior. The gene itself is not altered but the variations in its expression induce the development of malignant cells. The other mechanism is by creating novel genes by fusing two different genes through chromosomal translocation. As a result, the product of the gene will have an altered structure, location, regulation or activity. The abnormalities in gene products can also induce the development of malignant cells. The underlying causes of chromosomal are largely unknown but risk factors have been identified for the three types of leukemia. This is one of the reasons it is useful to study the diverse causes of leukemia by the types and subtypes of leukemia. Another reason is, that chromosomal translocations tend to be involved with the specific subtypes of leukemia. Leukemia can be classified into three groups, chronic myelogenic leukemia, acute myelogenic leukemia, and acute lymphoblastic leukemia. Each type has specific risk factors which might explain the underlying causes of the chromosomal translocations. Within each type, subtypes with specific chromosomal translocations may be identified. Chronic myelogenous leukemia a type of hematologic malignancy caused by the presence of the BCR-ABL1fusion gene. This is the result of the chromosomal translocation between the 9th chromosome (providing the ABL1 gene) and the 22nd chromosome (providing the BCR gene). The product of this translocation is the widely known, Philadelphia Chromosome. The underlying cause of this translocation is unknown but it has been associated with an increase in the exposition to ionizing radiation. However, the mechanism induced by the chromosomal translocation are well understood. The name BCR stands for “breakpoint cluster region” this codes for serine and threonine kinase region. The ABL1 gene stands for “Abelson murine leukemia viral oncogene homolog 1” that codes for tyrosine kinase region. Both kinase regions have the capacity to interact with other regulatory proteins, such the GRB/SOS/MAPK or the JAK/STAT pathways. As a consequence, the following cancer hallmarks can appear, sustaining proliferative signaling and resisting cell death. Another hallmark, genomic instability, can result from the other hallmarks adding further genetic abnormalities to the cell. In some cases, the alteration of genes, like the p53 gene, can induce a crisis which resembles the acute presentations of leukemia. Some of the acute presentations of leukemia are the acute myelogenous leukemia group. Even though the underlying cause have not been identified, there areseveral diseases which are risk factors for this group of leukemic diseases. These diseases include various genetic alteration in DNA repair functions. Among, these risk factors are ataxia telangiectasia, Fanconi´s anemia, Bloom´s syndrome, and Li Fraumeni´s syndrome. Additionally, there are environmental factors that are also associated to acute myelogenous leukemia. Among these factors are therapeutical agents and exposure to chemical agents. Among the therapeutical causes of leukemia are chemotherapy or the ionizing radiation used to treat other malignancies. The chemical agents include benzene and petroleum products have shown a weak link with this malignancy. Acute myelogenous leukemia is caused by many types of chromosomal translocations, many which are associated with the specific subtypes. The subtypes are identified by the type of cells which the cancer cells produce according to the French-American-British classification. The subtypes are M0 (or undifferentiated), M1 (or myeloid with no maturation), M2 (or myeloid with maturation), M3 (or promyelocytic), M4 (or myelomonocytic), M5 (or monoblastic), M6 (or erythroleukemia) and M7 (or Megakaryoblastic). One of the first translocations identified in acute myelogenous leukemia were found in the M2 subtype. In M2, it is frequent to find a chromosomal translocation between the 8th and 21st chromosomes, resulting in the expression of AML1-ETOfusion gene. The mechanism by which this fusion gene causes M2 acute myelogenous leukemias is not known. In contrast, the M3 subtype fusion gene product mechanism is known. The M3 subtype is produced by a translocation between the 15th and 17th chromosomes yielding the PML-RAR fusion gene. The PML gene means promyelocytic leukemia and the RAR gene represents the coding region of the retinoic acid receptor. Both original genes have transcription factors capacity but the function of the PML has not been clearly identified. The retinoic acid receptor, in the other, is responsible for promyelocytic differentiation by upregulating some genes and down-regulating others. It is involved with other genes such MYC and other target proportions. Together as fusion protein the PML-RAR, can lead to repression across out town. This is a good case in which the knowledge of the causes of leukemia, one can associate with anything. As lots of the regions of the original genes are preserved and these respond to retinoic acid, treatment with retinoic acid can be beneficial to these group of patients. However other translocations are also associated with the M3 subtype. The other variants of the chromosomal translocation, include translocations between the 5th or 11th chromosome with the retinoic acid receptor gene in the 17th chromosome. This translocation also produces a fusion protein, PLZF- RARD. This fusion protein also responds to the same treatment as the usual translocation. The last group of leukemias are the acute lymphoblastic leukemias. Like the other leukemias, lots of the factors affecting transcription factors are identified with this disease. In about 15% of patients with this type of leukemia have the BCR-ABL fusion gene. However, thereare other translocations specific to acute lymphoblastic leukemia. One of these chromosomal translocation occurs between the 1st chromosome and the 19th chromosome producing E2A-PBX1 fusion gene. The product of this gene interacts with the HOX11 protein, which in turn alters the cell cycle. Additionally, it can interact directly with DNA. These alterations, which can result from inherited or environmental causes, can predispose cells to become malignant by affecting its regulatory mechanism and introducing some behavior that matches the hallmarks of cancer. Another chromosomal translocation produces the TEL-AML1 fusion gene, after the translocation between the 12th chromosome and the 21st chromosome. It is the most frequent genetic alteration in pediatric acute lymphoblastic leukemia, but, ironically, it is rarely detected by cytogenetic techniques. The exact mechanism by which the TEL-AML1 gene is involved with the development of this hematologic malignancy is still unknown. However, it is interesting that individually TEL and AML1, are both involved in the development of other leukemias. It also important to point out the presences of other types of alteration in leukemias. Even though they are not the initial cause of leukemia, deletions and other mutations can lead to the progression of the disease. Additionally, that there much more translocations associated with each disease. Recounting all of them will require an extraordinary day to continue school. and. Because the cause of cancer has not been completely understoodsometimes the management of diseases does not provide the ideal results. Leukemia however, has been the subject of many studies and the mechanism by which, these diseases cause malignant behavior, are relatively well understood. The most common mechanisms in leukemia are chromosome translocation. Additionally, the numerous products of these translocation are also well understood. This knowledge has allowed the physician to regulate the mechanistic causes of leukemia. In the last decades, patients diagnosed with leukemia have had better outcome thanks to these developments. However, some patients have certain types of leukemias which do not respond to regular treatment. Therefore, research efforts must concentrate on identifying what are the underlying causes of leukemia. Perhaps, from the results preventive or treatment methods could be developed. Only through continuous research, medicine will continue to improve the life expectancy and quality of life.